Your vehicle is equipped with driver's and front passenger's pre-tensioner seat belts. 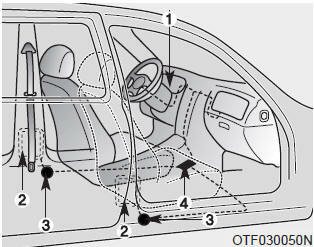 The purpose of the pre-tensioner is to make sure that the seat belts fit tightly against the occupant's body in certain frontal collisions (or side collisions). 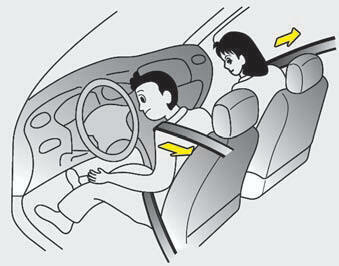 The pre-tensioner seat belts may be activated in crashes, where the frontal collision is severe enough. Do not put anything near the buckle. Placing objects near the buckle can adversely affect the buckle pre-tensioner and may increase the risk of personal injury in the event of a collision. 1. The seatbelt must be worn correctly and adjusted to the proper position. Please read and follow all of the important information and precautions about your vehicle’s occupant safety features – including seat belts and air bags – that are provided in this manual. Both the driver's and front passenger's pre-tensioner seat belts may be activated in certain frontal collisions. The pre-tensioners will not activate if the seat belts are not worn at the time of the collision. If the pre-tensioner seat belt does not work properly, this warning light will illuminate even if the SRS air bag has not malfunctioned. If the SRS air bag warning light does not illuminate when the ignition switch is turned ON, or if it remains illuminated after illuminating for approximately 6 seconds, or if it illuminates while the vehicle is being driven, please have an authorized Kia dealer inspect the pre-tensioner seat belt or SRS air bag system as soon as possible.